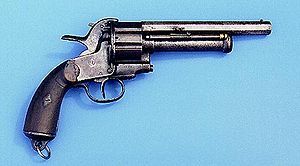 Note: Most widely used single action revolver of the Civil War. 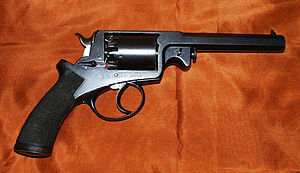 Note: The same design as the Colt Army but in a .36 caliber for the Navy. Note: Issued mostly to cavalry starting in 1848. Had 3 design changes until replaced with the 1860. Note: A popular high production weapon was in production until 1873. Sold in high quantities to European countries including England. Preferred sidearm of General Robert E. Lee. Note: Made in both .36 and .44, Remington was the second supplier to the military until the Colt factory fire in 1864 when it became the #1 military supplier. Known to be durable, dependable and accurate. 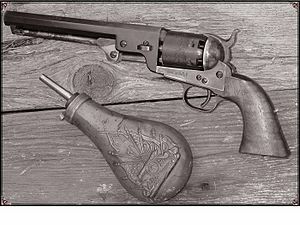 Note: A small production revolver favored by Confederate cavalry for their firepower before reloading. 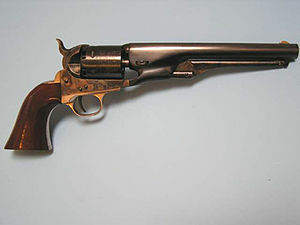 Preferred sidearm of CSA cavalry General J.E.B. Stuart. Note: Only 1,750 were purchased by the Federal Army at the start of the war. First true “double action” system. Known for their stopping power and their fast “double action” in close quarters.